Neighbouring Liberia and Sierra Leone are undergoing post-conflict transitions. And in both countries, national elections are ushering in new administrations. In March, elections will be held in Sierra Leone, and in January, George Weah took over as Liberia’s president from Ellen Johnson Sirleaf. Not only was Johnson Sirleaf Africa’s first female president, but she recently received the Ibrahim Prize for Achievement in African Leadership. Expectations that her time in office would deliver inclusive and real empowerment for women in Liberia were understandably high. But in Liberia and Sierra Leone, the reality is quite different. Both have made the right noises when it comes to empowering women, but Liberia and Sierra Leone feature among the 15 least gender-developed countries in the world, according to the United Nations Development Programme. The problem is not just a lack of adequate policies and laws, but – as is so often the case – poor implementation and the gap between national priorities and local realities. In both Liberia and Sierra Leone, national government can learn from local initiatives that are showing good results. In Liberia gender policy and an inheritance law have been adopted, and a Ministry of Gender and Women was established. These initiatives are geared towards providing free education for girls, and ensuring women have access to business opportunities and equal access to land. In Sierra Leone, the new constitution is more inclusive and addresses issues of equality. In 2007 a gender act was passed. Progress to eliminate barriers to women’s empowerment include three main laws: the registration of customary marriage and divorce; devolution of estate; and the domestic violence act. Both countries have also developed National Action Plans in line with their commitment to United Nations Security Council Resolution 1325, which calls for women to contribute to ensuring long-lasting peace. The plans are meant to provide a framework for empowering women that takes into account domestic needs and challenges. Liberia adopted its National Action Plan in 2009 and Sierra Leone in 2010. But instead of changing the underlying political, economic and social structures that disempower women, these National Action Plans focus on dealing with sexual and gender based violence. This limits the extent to which real gender equality can be achieved. In Liberia, where Johnson Sirleaf was president for over 10 years, less than 10% of people participating in politics are women. In Sierra Leone, which has a male president, the figure is just over 12%. The problem does not only lie only with political participation – women are discriminated against in education: literacy among women in these two countries is among the lowest in the world. Only 37.7% of adult females compared to 58.7% of adult males are educated in Sierra Leone and in Liberia, 32.8% of females compared to 62.4% males are literate. In Liberia women are actually worse off today than they were in 2003, especially when it comes to employment opportunities and access to justice. And in Sierra Leone, there has been an increase in violence against women since 2002. So removing legal barriers to women’s participation in society and developing new policies and plans have not ended discrimination in Liberia and Sierra Leone. What then needs to be done to empower women in a meaningful way? The change of administration in both countries is the ideal opportunity to revise and then properly implement policy. Both Sierra Leone and Liberia are poor countries with slow economic growth. Efforts to grow the economy must include gender-responsive budgeting. This should be done in consultation with civil society organisations to identify context-specific solutions. Indeed, the involvement of organisations working on women’s empowerment in national planning processes should be institutionalised. The Liberian experience shows that having women at the highest level of government does not necessarily change the lives of ordinary women for the better. In this respect, women with existing technical capacity should be identified and trained specifically to take up high-level, decision making roles. A strategy should also be developed and funded for long-term support to build the capacity of women’s networks to engage in political dialogue. The new administrations in both countries need to focus not just on getting the right laws and policies in place, but on implementing new and existing ones. A first step is harnessing the good lessons from their own communities, such as the peace huts in Liberia and the peace preservation projects in Sierra Leone. Both initiatives engage women actively and have brought lasting peace to their communities. The peace huts allowed women to raise concerns, like the need for better livelihoods, and the peace preservation projects gave women an active role in changing social attitudes, especially about their role in decision making in Sierra Leone. In both countries, these local projects gave women access to resources like seeds for agriculture or scholarships for young girls. These initiatives strengthened the voice of women which in turn can empower others. 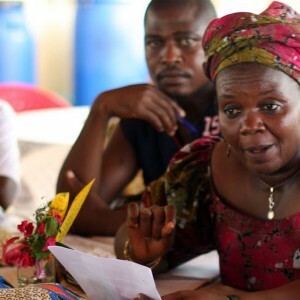 In Liberia and Sierra Leone most women empowerment initiatives happen at local level. Awareness raising activities, community dialogues and media strategies focusing on these achievements can produce visible, practical methods for redress at the national level. Meaningful change takes place at community level because it is driven by needs and experience. If these successes can be translated into policy and plans for the country as a whole, women’s empowerment is bound to become a reality in Sierra Leone and Liberia.